I love that my grandchildren love to cook and absolutely love that they like a challenge. My eldest makes perfectly shaped butter cookies; the next eldest recently cooked a vegetarian rice and beans dinner for her siblings. One of them once helped me bake a flourless chocolate roll for Passover. 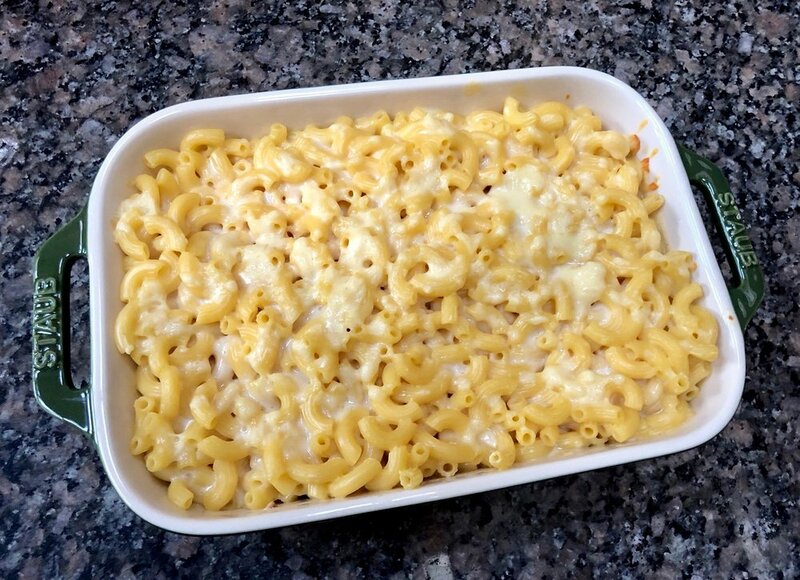 Recently, my 9-year old grand daughter said she was bored and wanted to cook something really delicious, very pretty and also "hard." 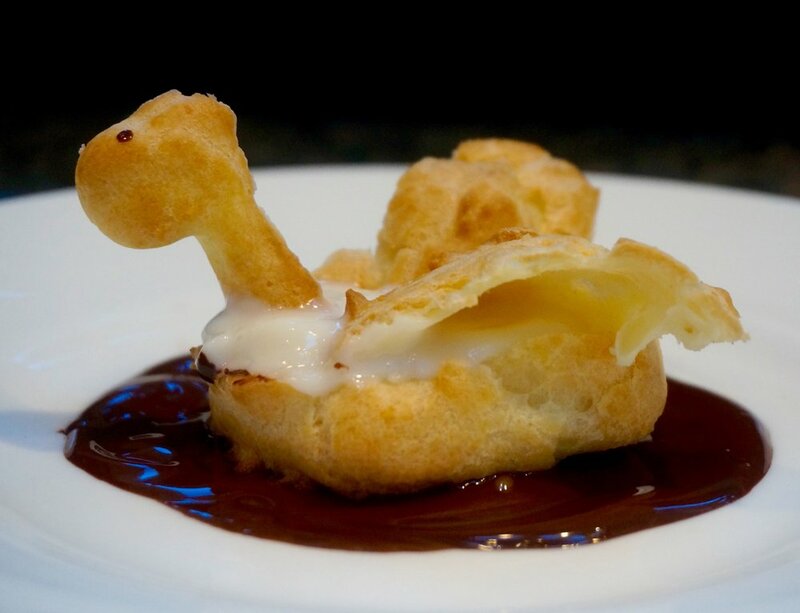 What better choice than cream puffs made into the shape of swans?! I have taught baking classes on this particular recipe and have seen fully committed grown ups nervous about getting it right. But off we went into the kitchen. 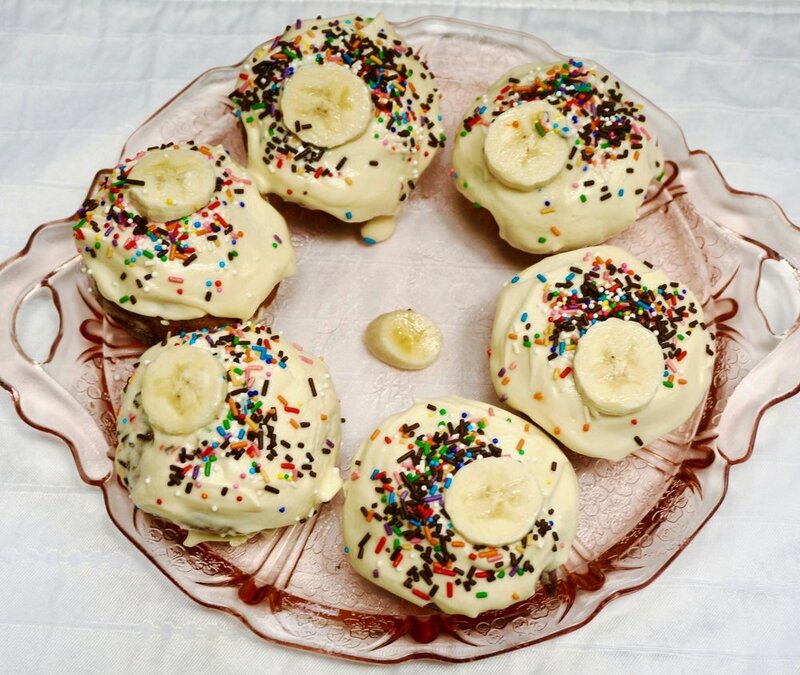 There are two really difficult challenges to making swan shape cream puffs. The first thing is mixing the eggs into the butter-flour dough, which is very stiff and therefore not easy to incorporate the liquidy eggs. Fortunately, this kid is athletic, with the kind of strong arms that come with spending hours doing chin-ups and stuff at the playground. No problem! Stiff dough/eggs, perfectly mixed and blended. Check! The second hard part is piping out small slivers of dough for the necks. There were lots of not-so-good ones (we just ate these as snacks after they were baked) but she did manage to create enough for us to use in the final product. After that it was easy: we made some vanilla pudding but I told her that some other time you could also fill the swan bodies with whipped cream, sorbet or ice cream. She said it would be really nice for the swans to have something to swim on. Remember that old piano piece, Swans on the Lake? The music that so many of us learned as children taking our first year or so of piano lessons? Well of course, there had to be a lake. We melted some chocolate. So easy. So lovely to look at when we put the swans down on each serving plate. Wouldn't this be a beautiful finale to a lovely dinner for New Year's or someone's birthday or other special occasion? Preheat the oven to 425 degrees. Cover two baking sheets with parchment paper. Whisk the flour, salt and sugar together in a bowl and set aside. Heat the water and butter in a medium size saucepan. Bring the mixture to a boil over medium heat. When the water comes to a boil, raise the heat and add the flour mixture, all at once. Stir vigorously with a wooden spoon until the mixture is blended and begins to come away from the sides of the pan. Remove the pan from the heat and let it cool for 2-3 minutes. Add the eggs, one at a time, blending well after each addition. Spoon 12-18 mounds of the dough onto one of the baking sheets, shaping them into ovals with your fingers, and leaving some space between each oval for the dough to spread. Place the sheet in the oven and bake for 18-20 minutes. Reduce the heat to 375 degrees and bake for another 12-18 minutes or until puffed and golden. Remove from the oven and let cool. To make the necks, preheat the oven to 400 degrees. Spoon some of the dough into a pastry bag fitted with a narrow-holed tip. Pipe the dough into "S" shapes about 2-inches long onto the second baking sheet. Bake the necks for about 15 minutes or until golden brown. To assemble: Split the swan puffs in half lengthwise using a serrated knife. Cut the top portion in half lengthwise to use as wings. Spoon some whipped cream, ice cream, sorbet or pudding into the swan bottoms. Arrange the split top wings on top of the filling. Spoon some melted chocolate or chocolate sauce onto dessert plates. Place the filled swan bottoms on top of the chocolate. Insert the necks into the front. If desired, use a toothpick to dip into some meted chocolate and make a dot as an eye on the top of the neck. And so, another generation of passionate, creative cooks. Recently I spent some memorable time with one of my grand daughters. She cooked almost an entire dinner for herself and siblings as I watched. I encouraged her to use her judgment about flavors and amounts. She was thoughtful, asked questions and was unafraid to follow her senses and taste buds rather than someone else's recipe. At each step of the way she got off the stool she needed to reach the pan so she could write down what she did. In the end: Rice and Beans with Roasted Brussels Sprouts for 4. First, I must say, she knew to wash her hands before cooking. She also used disposable gloves when she tossed the Brussels sprouts in olive oil. I watched her pour olive oil into the pan and toss a bit of chopped onion in to see if it sizzled because I had told her that's when the oil was hot enough for the rest. She added chopped onions and made a decision about how much was enough. About 1/4 cup. I told her how to rinse the beans, and why, and watched her do it. She added the beans and some crushed tomatoes and when she said she didn't think it was tomatoey enough I encouraged her to add more. And she did. She wondered about spices. I suggested either chili powder or cumin and she asked "why not both?" Indeed. I told her to add both, starting with 1/2 teaspoon each. When she tasted she said it needed more chili powder. And added some. And salt. To her taste. As the beans cooked, she cut the Brussels sprouts, placed them on a baking tray, tossed them with olive oil, sprinkled them with salt and placed them in the oven. The only thing I cooked was the rice. Everyone gobbled up this magnificent feast. The perfect meal for a meatless Monday or whenever you have yen for a scrumptious vegetarian dinner. I left smiling. Still am. Place the rice and water in a saucepan over high heat. Bring the water to a boil, turn the heat to low, cover the pan and cook for about 35 minutes or until the grains are tender and all the liquid has been absorbed. While the rice is cooking, pour the olive oil into a saute pan over medium heat. Add the onion and cook, stirring occasionally, for 2-3 minutes. Add the beans, tomatoes, chili powder, cumin and salt. Stir to distribute the ingredients evenly. Cook for 8-10 minutes. Spoon the rice onto plates; top with some of the rice and beans. My grandson wanted to bake a cake with me. I think he actually liked the licking-out-the-bowl part the best and I actually was most thrilled that he came up with the idea about combining banana bread and chocolate cake. I looked through my recipes for endless variations of banana bread. And chocolate cake. I fooled around with them, combining this and that from several of the recipes and came up with the one here. It's dairy-free, so his sister, my 3-1/2 year-old grand daughter, could eat some too. And we added some chocolate chips, just for good measure. He did like the licking-out-the-bowl thing. He also told me the cake was too dry. But I think that was because the temperature indicator on my oven has been cleaned so often for so many years that the numbers have disappeared and I can only estimate the proper cooking temperature. I do have an oven thermometer but that also needs "updating." so I don't know if the cake baked at exactly the right temperature. Also, I forgot to set the timer. Anyway, everyone else declared the cake delicious. Even my grandson said it was and would want it again when I finally decide what oven I want to get to replace the old one. So here it is, the creation. Preheat the oven to 350 degrees. Grease and flour a 10-inch (8-cup) bundt pan. Mix the flour, cocoa, salt, cinnamon and baking soda together in a bowl. In the bowl of an electric mixer beat the shortening and sugar at medium speed for 2-3 minutes or until well blended. Add the bananas and blend them in thoroughly. Add the eggs and vanilla extract and blend them in thoroughly. Add the flour mixture and beat until batter is well blended. Fold in the chocolate chips. Pour into the prepared pan and bake for 60-70 minutes or until a cake tester inserted into the center comes out clean. Remove from the oven and let cool in the pan for 10 minutes. Remove to a cake rack to cool completely. Children learn a lot when they cook, and not just about food. You can ask the youngest ones to hand over the red pepper, not the green one. You can show them that a pie tin is round, a loaf pan is a rectangle. Older kids can hone their measuring skills. Some begin to understand the difference between 1/4 cup and 1/2, what a dozen means, why a cake rises. Recently my grandchildren, ages 3 and 5, learned another important cooking lesson: when and how to substitute ingredients. We happened to be baking Jam Cookies. I didn't have the chopped dates called for in my recipe. So we changed those to dark raisins. I didn't have dried apricots, figs or cherries, so we used dried cranberries instead. They wondered whether they could include chocolate chips. Of course! Just throw some into the bowl. Finally, we used a mixture of orange marmalade, rhubarb and apricot jam because I didn't have enough of any one kind except raspberry, which I couldn't use because of allergies. But more than that, the cookies were absolutely delicious. Even the adults gobbled them. The children were happy, they learned more than they realized. They want to cook with me again. I love that. Preheat the oven to 375 degrees. Lightly grease a 9"x13" cake pan. Mix the flour, baking powder and salt together in a bowl. Add the oats and brown sugar and mix the ingredients thoroughly to distribute them evenly. Cut the butter into chunks and work into the dry ingredients (with fingers or process on pulse in a food processor) until the butter is completely mixed in and the mixture looks crumbly. Mix in the raisins, dried fruit and chocolate chips. Press the mixture evenly inside the prepared pan. Bake for 35-40 minutes or until golden brown. Let cool in the pan. Cut into bars or squares. How big chunks get chopped into little pieces. What happens to eggs when they're boiled. What vanilla extract and whole cloves smell like. Why some people fry "grilled cheese" and some people cook it in a toaster oven. How sushi/sashimi feels in your mouth. Big questions. All of them. And if you encourage their curiosity, children learn much more than about the food. They learn that you will feed the hunger in their brain as well as in their stomach. 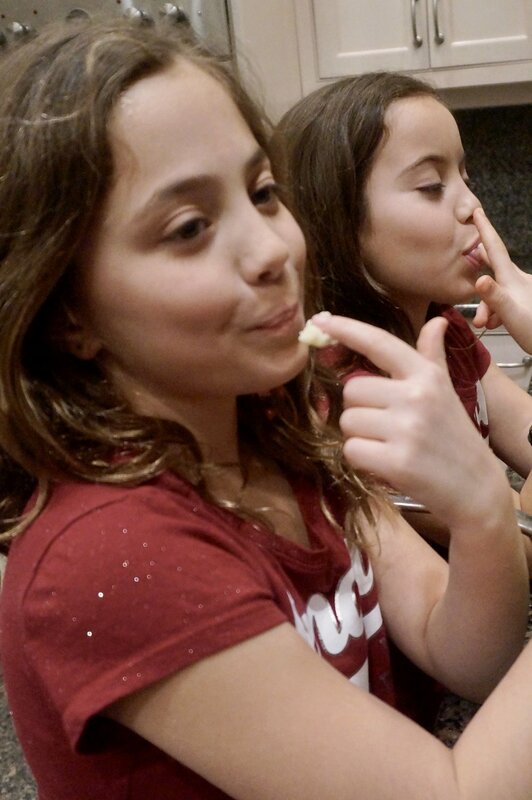 I think maybe kids begin the want-to-cook process when they are really young and they get to lick the bowl or taste a hunk of whatever it is you are cooking. Usually something sweet like cake batter or cookie dough. Two of my grand daughters once shared a batter bowl and spatula, as you can see in the first photo. YES I KNOW ALLOWING THEM TO LICK THE SAME SPATULA isn't the most sanitary thing. But that picture, one of my favorites of all time, reminds me of the great time we had that day. And that they continued to enjoy cooking, with me and their parents. They are older now and recently graduated to knife skills. In the second photo they are chopping scallions. Another wonderful day. They are fully into the whole cooking thing and I know that these early adventures will make them unafraid of cooking for the rest of their lives. The recipe for the cake they made on the sharing-spatula day is here. The scallions? Used for the salad recipe that follows. If you have a child or niece or nephew or neighbor or know some other kid, encourage him/her to cook. And better yet, do it with them and have some fun. Place the tomatoes, cucumber, bell pepper, avocado, chick peas, olives, eggs, scallions, parsley and dill in a bowl and toss ingredients gently. Just before serving, mix together the olive oil and lemon juice and pour over the salad. Season to taste with salt and pepper. "This is just like room service!" That, from my almost 6-year old grand daughter Lila (who apparently already knows about room service!?!) after I let her have her dinner in the family room and watch TV. This is something I didn’t allow my own two daughters. But honestly, after 35 years I was a little out of practice. And, like bike riding, you may not forget how, but you also may not race through the streets or peddle yourself up a steep hill quite as often or as easily either. So, when the kids came for a visit, sans parents, from Friday through Sunday, there were occasional, let’s say, concessions. If my daughter Gillian, their Mom, is reading this now, I say, don’t worry. These kids are terrific and 2 meals in front of the TV won’t harm them. As you can see from the photos we did lots of stuff like draw, have a pedicure, blow bubbles outside, ride bikes, have a fashion show. We also frosted a birthday cake for their cousin Nina’s birthday party on Saturday (although the top decoration, an Ariel rice-paper scene, was store-bought). The little one, Remy, age 21 months talks a blue streak although sometimes it’s difficult to understand his pronunciations. However, one of the new words he learned this weekend was “chocolate cake,” which he mentioned to his parents as soon as they walked in the door Sunday night. "Tzockickcake!" he told them, with his tongue literally licking his lips. I had baked the chocolate cake for a Hadassah Tea and was cutting it into slices. There were a few not-so-lovely pieces that I didn’t include on the platter I sent over for that event. Remy had a small sliver of the leftovers. He liked it, that’s for sure. Can’t say I blame him. Smart kid!